Because this is the flip-side of a record that for years has had its release date wrongly attributed to 1946 rather than its actual 1949 appearance on the marketplace, chances are many of those landing on THIS review to find out the truth of when the single came out and the circumstances around its historical misappropriation would like a quick and easy synopsis of the full story. But while understandable, that also runs counter to the primary job here which is to review each song on its own merits and with the backstory already extensively covered in yesterday’s review – which left comparatively little room for the analysis of what turned out to be a very good rock record – today we need to move on and look forward more than look back. Besides even if we wanted to add a simple recap “quick and easy” can’t possibly begin to sum up the entire ordeal. However for those who can’t get enough of the intrigue and drama surrounding the Byzantine series of events over more than a half century that led to this confusion over whether or not 15 year old Joseph “Mr. Google Eyes” August invented rock ‘n’ roll a year before it actually WAS unveiled to the world by Roy Brown, well, suffice it to say that in spite of how deep we examined the particulars in the case yesterday, there’s a just littttttttle more to delve into in that regard today. For those who HAVEN’T read the full report on this yet, it definitely helps if you go back to the review for the A-side of this release, Young Boy, to get caught up on all of the relevant points. But assuming that for those still reading this one you’ve already done so, let’s jump into it a little deeper here before getting to this song, the delightfully named Poppa Stoppa’s Be Bop Blues which not so coincidentally is the final (of many) definitive clues that unraveled the entire 1946 myth that had existed for so long. For those not in the know, the term Poppa Stoppa was slang for a condom (I’m sure you can figure out what it means, if not you’re far too young to be reading about rock ‘n’ roll anyway). But it was also the name which Vernon Winslow, a black man hired to coach a white dee jay into sounding authentic for hosting a radio program aimed at black listeners, gave to that white DJ to use as a distinctive on-air moniker. We already covered that topic in great depth on a song by Paul Gayten that was dedicated to Winslow called Backtrackin’, so you can catch up on that angle by reading about it more there (notice how one way or another we’ll cleverly get you to read ALL of our reviews here, now four hundred and counting!). Anyway The Poppa Stoppa show only began in 1947! So for those insisting that this record came out in 1946 the obvious question is how could August be singing a song named in his honor before that name was ever used on the air? You can’t try and claim the song is about the condom once you listen to the lyrics either, as it very clearly is about a person and the music he plays over the radio. By 1949 both Poppa Stoppa, the white dee-jay who took on a black persona on the air, and Winslow himself, now dubbed Dr. Daddy-O and finally allowed to break the color line and broadcast over the airwaves on a different station in New Orleans, were both spinning LOTS of rock ‘n’ roll for every listener in the region to soak up. One of those who did was local teen Joe August who immersed himself like so many of his generation in the music of the first generation of home grown rock stars, not just Roy Brown and Paul Gayten (who backs him on this) but also fellow hit-makers Annie Laurie, Chubby Newsom, Dave Bartholomew and many others, most of whom hadn’t yet cracked the national charts but had made names for themselves around town playing this brand of cutting edge music. 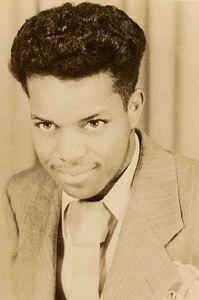 Ironically though while the music on Young Boy was a full-bodied futuristic explosion of sounds, on Poppa Stoppa’s Be Bop Blues he takes a more modest approach, one still firmly in the setting of 1949 rock, but in a downbeat bluesier motif that was one of the vital alternatives to the louder more raucous sounds that were garnering so much attention. Before we progress any further, since we were running out of room on the first review for Joseph August, we should take a moment to tell the uninitiated why he was dubbed Mr. Google Eyes on record and why that was NOT a troubling racist moniker slapped on him by some backwards thinking Neanderthal in the record industry. As a kid August was working for a guy named Dooky Chase who ran a club/restaurant in New Orleans. Mostly he was delivering food on his bike but at times he’d help in the kitchen and while doing so he happened to pay more attention to the pretty women in the restaurant through the service order window than to what he was doing and Dooky chided him for it, saying “You better get your google eyes out of there!” and just like that the name he’d use throughout his career was born, though it’d often be shortened to simply Mr. G.
It was also at Dookey Chase’s where he got his start singing on the bandstand, which is more likely what he was referring to when he said he got his start as a 15 year old. Then again in these same interviews he DID make specific reference to dates, but they were 1947 and ’48 and that’s when he claimed he was just 14 years old. His birth certificate of course tells another story, which the same writers reported, yet they never seemed to bother to correct the age and thus the dates for his first release got pushed back, resulting in the misleading information that has made a mess of the history books. In any case, Mr. Google Eyes was unveiled to the world with Coleman 118, definitively released in late summer of 1949 and already it showed him to have a good grasp on versatility. The difference tactics he takes on the two sides of his debut was a virtue in the singles era, something we keep hoping to see record labels insist upon as it gives listeners two distinct choices to help convince them to make the purchase, and it also helps to push the artists themselves into diversifying their style rather than sticking with just one approach to boost his appeal and help him commercially in the long run. Yet for every artist there’s bound to be one specific type of song that has the stylistic advantage for his natural talents and – for this release anyway – it’s not Poppa Stoppa’s Be Bop Blues. But that’s not to say that it’s a bad song or a bad performance. In fact Mr. Google Eyes himself actually might do a better job vocally on this one, as it keeps him somewhat reined in. His modulated voice is the first sound you hear and for a moment or two it reminds you of Andrew Tibbs, another teenager who was immediately captivated by Roy Brown when Brown’s Good Rocking Tonight launched rock ‘n’ roll in September 1947. But as he goes along he shows that while he has a good voice, he doesn’t have a transcendent voice like Tibbs, so in that regard he’s not going to be able to completely overwhelm any serious musical, lyrical or conceptual missteps on this record. Which is why it’s good to hear that he’s constructed himself a fairly solid song, one which features a better, more coherent, story line than the more boisterous flip, and if the musical components themselves aren’t nearly as exhilarating here they’re entirely fitting for the vocal mood he projects. Everything here is taken at half-speed, from his own weary vocals to the slinky musical backing which displays a light touch with all of the instruments being featured to good effect. Edgar Blanchard’s haunting guitar accents set a good mood and the subtle piano of Gayten that’s being entrusted to carry the rhythm is helped along by horns which add the right sultry tone to the instrumental interludes This just sounds like a perfect late-night mood piece, one tinged with regret maybe, or at least a resigned indifference at whatever fate he’s about to meet. But that’s also where the song let’s us down to a degree, for while it sounds perfectly appropriate, the two entities playing off one another with careful deliberation, when you actually study the lyrics you see that the story line doesn’t mesh with the atmosphere. Essentially the lyrics are a celebration of sorts as he talks about meeting the radio star who is dressed to the nines and he makes it clear how impressed he is by him, speaking almost in reverent terms, even claiming that “Poppa Stoppa made a blind man see him and a dummy walk and call his name”. Aside from the mystical hold a mere disc jockey can have on an enthusiastic rock fan in this era where such things as radio stations catering to their tastes were unheard of, the obvious takeaway from this is that this was a transformative event to be able to see him in the flesh and find out the voice crackling over the airwaves was attached to someone who actually lived up to his larger than life persona. So why then is this paean to him attached to such a plodding song? The obvious reason is found in his own inexperience. While August shows good instincts as a writer – on both sides actually – his technique in fleshing those ideas out are still lacking. On this he sticks to a twelve bar blues framework, something that for beginning songwriters is a fairly simple and straightforward process, but he’s seemingly unable to re-imagine it at a different pace. This is where Gayten needed to step in and lend his expertise to reshape it, but whether he didn’t want to hurt the kid’s feelings or maybe was told by the Coleman brothers, gospel artists themselves who knew the market benefits of having two vastly different styled songs on one single, they kept this in not only the slow lane, but the breakdown lane. Because it progresses at a crawl – so much so that you actually become impatient for the set-ups to resolve themselves and when they don’t do so adequately you wind up more disappointed than anything – there’s nothing for the musicians to do to embellish things. They play their parts fine, I wouldn’t change a thing about their technique in fact and both Blanchard, who stays more in the background on this side, and saxophonist Lee Allen, who gets a nice languid solo two-thirds of the way through, are excellent. But what I WOULD change is the lyrics… the subject… basically the entire idea behind the song. Or rather I’d save all of those things for a later date, one to be revisited when he’s been around the block more and knows how to craft a song where all of the components work in tandem. On Poppa Stoppa’s Be Bop Blues that’s most definitely not the case. When he states that he was smiling to himself walking down the street you ask yourself why, because by the sound of everything else – from the music to his vocal tone – you’d have guessed he just left a funeral home where his mother was laid out. Though much of this is good in concept it’s mismatched and as a result it sounds far better to hear it in passing without actually listening too closely. 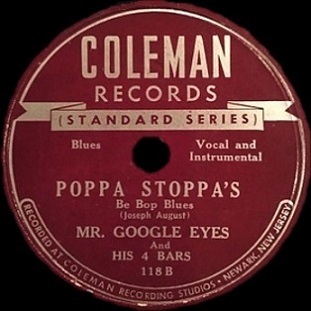 Leave a reply on "Mr. Google Eyes: “Poppa Stoppa’s Be Bop Blues”"